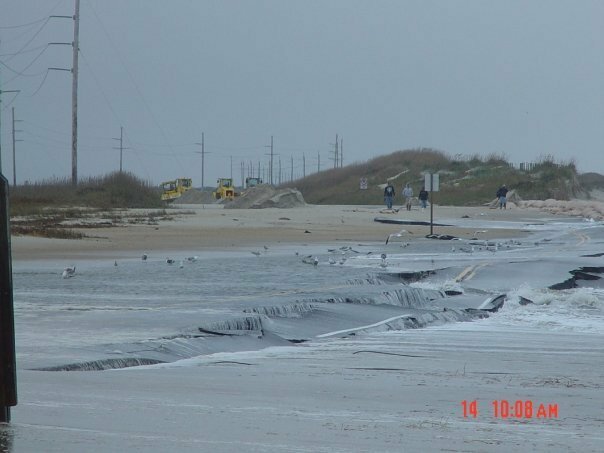 Caleb Jacobs sent these remarkable images of the Friday the 13th Nor'easter devastation to Route 12 at S-Turns just north of Rodanthe. We all knew it would be bad down there, but the way the road is literally destroyed lays credit to the power of the ocean. Likely, Rodanthe and Avon will be cut off for some time as the aftermath kicks in. Ironically, this storm was really not the worst the OBX experiences, yet given the destruction of the S-Turns dune line the week prior by a relatively minor NE blow, and the literal naked beating of the area again over the past few days, there is not much left... To add additional injury to the mess, more NE wind is forecast for start of the week! Good luck NC DOT!! 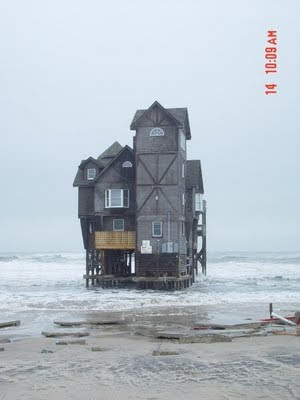 Amazing the Nights in Rodanthe House, Serendipity remains standing out in the ocean's wash. That place is going to fall soon, and all its material will litter the beaches as does all the other ocean front properties which have fallen to the surf. 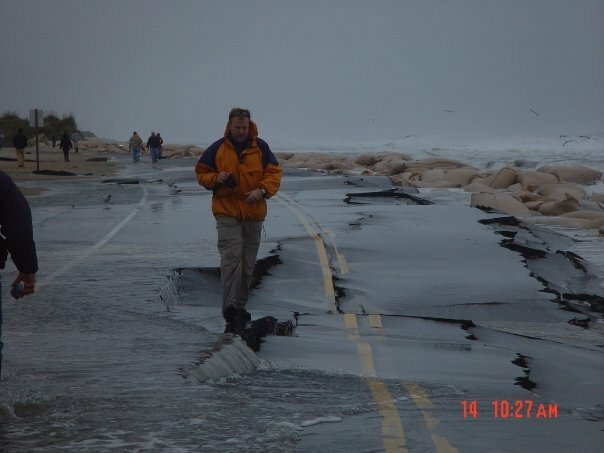 If anything, be careful if you head out into the zone, or even a casual beach walk; not for the pounding Hatteras bombers, but rather that decking or roof truss with nails sticking out of it!! Actually, all these houses which are in the water, and condemned to fall, should simply be demolished in a controlled manner to prevent the littering of the beaches. On a calm sunny day, Serendipity should simply be brought down and hauled away, rather than allowing the Atlantic to do the job. 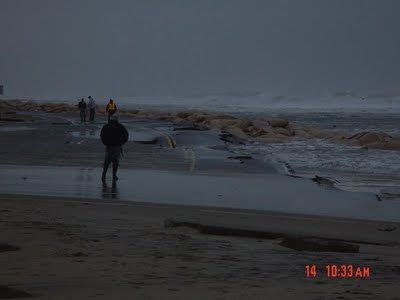 Dramatic shot sent in from Dale Bendula highlighting the storm surge in Buxton. Yikes! I have a snapshot of S-Turns in my head...wow is it gone. Bill, i totally agree with you on the trash going into the ocean. how crazy is that. someone told me its all because of insurance money.. i.e.. if the owner let a salvage crew come in and remove the house..they won't get any money! so they have to let the ocean take it away to get paid. crazy. 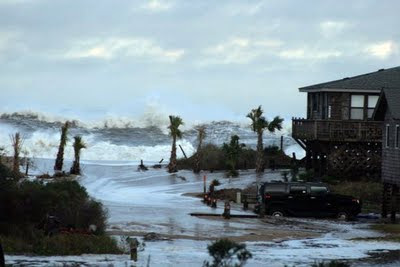 only the state legislators could pass a NC law stating that once a house gets to this stage then the insurance companies have to pay the owner etc.. then the salvage could be done before the ocean does the job. not sure if this is true..but it sounds likely. any NC insurance agents out there to comment? I am not a big fan of "eminent domain" but in the case of these ocean front properties where there is no realistic way to beat mother nature, they simply need to be taken down. They are literally a threat to our coastal waters, beaches, and public well being. The homeowners and insurance companies should be held accountable for this shameful disregard. I was out today checking the inshore surf here in Nags Head, and it makes me half sick to see all the waste lumber and debris floating in the ocean. It is simply not safe to enter the water here. The rip currents and surf size are the least of your worries, when you have large pieces of deck timbers and other construction waste debris bobbing in the water every 10 feet! Its a shame that much of this could have been prevented if these lost properties were simply demolished by man as compared to nature. god forbid a surfer/boogy boarder got knocked out from hitting some of that debris,i wonder if we could start a law suit of some kind,any lawyers care to chime in? Caleb, Nice photos of an intense Hatteras experience. A photographer and a musician...hmm..
Big Nor' Easter Later this Week?! Surf Down South at Izzys! COLD!! Is it Late Dec on the OBX?! Hatteras Fall Conditions are Here!! The 2010 Legend, Fresh Out of the Tissue Paper! Hatteras Wave Jam Extended!! What a SCORE!! Hatteras Wave Jam Tropical Edition Scored!! Hatteras Wave Jam Tropical Edition is Here!